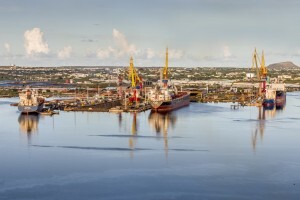 WILLEMSTAD – The PWFC union wants to immediately start with the negotiations for a new collective agreement between Damen Shiprepair & Conversion and the employees. This is according to Sharette Janga, of the PWFC union. As was announced last week, Damen Shiprepair & Conversion (DSC) has taken over the management of the Curaçao Dry Dock Company (CDM) as of February 1st, 2017. The DSC also took over all the CDM employees. “The time is perfect for PWFC to start negotiations for a new collective agreement,” Janga explained. Janga told the employees that they deserve the best secondary benefits. “The search for a strategic partnership has been a process that started since 1993 and finally we can say we made it. We are so excited for this achievement. Damen, together with the Curaçao Government, will also invest in training and schooling of local technical personnel, ensuring the development of local skills, further developing the local industry and encouraging employment opportunities in the area.